There is an urgent need to help revive an ailing domestic general aviation industry in the United States. That imperative is receiving increased attention by NASA. To this end, by way of a Langley Research Center Phase I Small Business Innovation Research (SBIR) contract, DARcorporation of Lawrence, Kansas has made the art of designing a general aviation aircraft far easier and less expensive. Today's elite corps of aircraft manufacturers utilize powerful computers capable of running expensive Computer Aided Design (CAD) software. But the majority of small General Aviation manufacturers cannot afford these investments. Rather, small firms design on paper or with computers utilizing self-generated programs on spreadsheets. 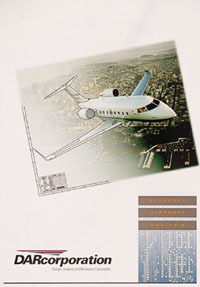 DARcorporation's General Aviation Computer Aided Design (G.A.-CAD) package can cut in half the design and development time of a general aviation aircraft. NASA SBIR funding helped bring the software to the computer screen. DARcorporation has developed a General Aviation CAD package. This affordable, user-friendly preliminary design system for General Aviation aircraft runs on the popular 486 IBM-compatible personal computers. The system gives the design engineer the tools to briskly evolve an aircraft configuration from weight sizing and wing loading to stability and control surface requirements, among a host of parameters. A Phase II SBIR contract was awarded by NASA to the company, resulting in a commercial product that the firm is now marketing. Individuals who are taking the home-built approach, small manufacturers of General Aviation airplanes, as well as students and others interested in the design and analysis of aircraft are possible users of the package. DARcorporation's General Aviation Computer Aided Design (G.A.-CAD) package can reduce design and development time by 50 percent, replacing tedious hand calculations. Typically, design cycle times of two to four years are required to fully conceive a General Aviation aircraft. G.A.-CAD can reduce this time period by half, notes William Anemaat, Vice President of DARcorporation. The G.A.-CAD enables a user to analyze an existing design, make small changes to one part of the aircraft, and then rapidly determine the effect of the modification to all other aspects of the plane design. All applicable performance and flying quality regulations are embedded in the program. This gives the designer an immediate judgment as to whether or not the design meets air worthiness regulations. Such a feature, therefore, benefits those manufacturers with little experience in obtaining General Aviation aircraft certification. Engineering Systems, Inc. (ESI) of Colorado Springs, Colorado, is using the DARcorporation's software for aircraft analysis. A small consulting firm in simulator development and a broad spectrum of other engineering disciplines, ESI used the software in the development of an aerodynamic model of the Airbus A320 jet transport for a training device. "We are pleased with the program and have found that the initial cost was quickly repaid in reduced labor costs," said ESI's Director of Aeronautical Engineering, Dr. David L. Kohlman. Modeled after DARcorporation's work on Advanced Aircraft Analysis (AAA) software, the G.A.-CAD package features ten discrete modules: weight, performance, geometry, aerodynamics, thrust/power, stability and control, dynamics, loads, structures, and cost. These features improve product design. More alternative designs can be evaluated in the same time span, which can lead to improved quality. By using the cost module, various expenses in airplane design programs can be computed. Research and development, manufacturing, prototype, and direct and indirect operating costs can be estimated using this module. G.A.-CAD incorporates a user-interface based on the Microsoft Windows ® operating system, making the software package highly user-friendly. Having the software package at various General Aviation manufacturing sites, DARcorporation expects to see significant improvement of competitiveness, and should bolster the chances of success for newly established companies.